Fun theatre and acting themed badge in black and yellow. 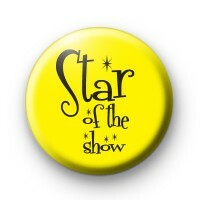 This badge reads Star of the Show in a fun black text. It is a great badge for anyone that enjoys acting, theatre and movies. A lovely handmade gift for the budding actresses and actors in your life or for teachers to give to their Drama students as fun keepsakes after a performance or school play! We have lots of great Stage & Movie themed pin badges in the shop so be sure to check them out too.